That bag of tomatoes you see here? They’re from our garden last summer! I’ve been gardening for almost 40 years, but it wasn’t until last year that I learned you can freeze whole tomatoes. Henry Homeyer, an organic gardener who lives in New Hampshire, tipped me off. Henry writes a weekly gardening column in our local paper, and he’s full of good advice. Like last September, when he said nothing could be easier than freezing whole tomatoes. “No blanching required,” wrote Henry. 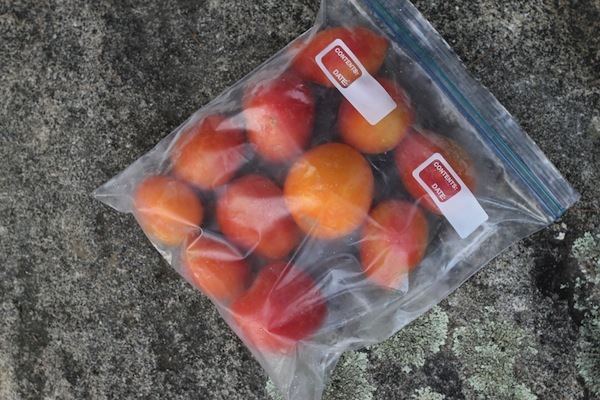 “Just put clean, dry tomatoes in gallon zipper bags and freeze. Then, when you need tomatoes to cook with, take out a few and run them under hot water in the kitchen sink. Rub and the skins come off. Allow them to sit for a few minutes and they soften enough to chop and use.” Who knew?! I don’t even bother with the hot-water rinse, as I like to cook the skins. To be honest, I didn’t expect these frozen tomatoes to be as good as they are. They’re delicious, and we’ve been using them in stews, soups, sauces, and curries since last fall. We’ll definitely be freezing more tomatoes this summer! One of our favorite ways to use them is in this spicy Indian curry. We made it just two nights ago, after a day of steady, chilling, rain, and it was just what we needed: tasty, warming, and made with our own tomatoes. The recipe below serves two (maybe three) as a main course. Enjoy! This recipe is adapted from 660 Curries by Raghavan Iyer. He calls it Cayenne-Spiked Cauliflower, but don’t let that scare you. The dish is spicy, but you can tame it by cutting down on the cayenne. If you're at all hesitant about spicy food, I'd start with half the amount called for below. Heat oil in a large skillet over medium heat. Add the onion, garlic, and ginger and stir-fry until they are nicely softened and slightly brown, about 10–12 minutes. Sprinkle in the cumin, coriander, salt, cayenne, and turmeric. 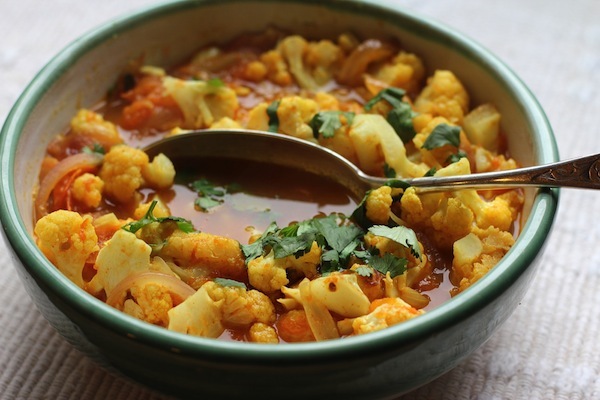 Stir well and cook about 30 seconds, then stir in the tomatoes with their juices, the cauliflower, and 1 cup water. Deglaze the skillet, releasing the bits of vegetables and spices, and bring the curry to a boil. Reduce the heat to medium-low, cover the skillet, and cook about 12–15 minutes more—stirring occasionally—until the cauliflower pieces are tender. Uncover the skillet and let the curry simmer a few minutes longer, to thicken up a bit. Stir in the cilantro and serve. Very well said, your site is a great reference.